There can be no doubt that under Trump conservative Christians have been flexing their muscles. Few things corrupt so readily as political power, and evangelicalism—already an unrealistic way of looking at things—is itching to throw punches. A story on For Reading Addicts that my wife sent to me bear the title “DC Comics cancel latest comic after backlash from conservative Christians.” The piece by Rowan Jones notes that Second Coming was cancelled due to pressure from evangelicals with the cultural sensitivity of the Kouachi treatment of Charlie Hebdo. Cartoons, it seems, are a real threat to true believers in a way that reason is not. Jones notes that the comic was actually largely supportive of Christian values, but like an evangelical Brexit the reaction was taken without understanding the issue. The anger of conservative religions—it hardly matters whether they are Christian, Muslim, or Aum Shinrikyo—often plays itself out in displays of violence. I wonder if part of this insecurity comes from the fact that the expectations of their faith don’t work out they way they’ve been led to believe they will. The myth of the blessed existence of the true believer is given the lie by life in a secular world. While the evangelicals support Trump, 45’s tax plan takes money from their pockets and hand it to the ultra-wealthy. This raises no objections, but a cartoon showing Jesus helping the poor?—now that’s offensive! And still no second coming takes place. It’s difficult to retain a fantasy view in the face of cold reality. Who doesn’t like a hero? Religious beliefs are a deeply personal matter. It is a dicey business to try to get someone to change their outlook when they’ve been convinced that the consequences are eternal. Although vaguely aware of other religions all along, Christianity in the “new world” was taken quite by storm at the 1893 World’s Parliament of Religions in Chicago. Suddenly it was clear that other moral, decent religions had developed similar ethics to what had largely been supposed to have been Christian innovations. It’s difficult to feel superior when others in the same room seem just as intent on improving the lot of humankind as you do. Even when a particular religion holds all the political power of a nation it’s overly sensitive to cartoons. This is a curious situation indeed. I’m not a comic book reader—I don’t even have time for internet articles unless someone sends them to me with the suggestion that they’re worth my time. And I, for one, think a little more humor might just make the world a better place. Either that or we need a hero. One thing we can say about the misguided leadership of this country is that they’re taking the Bible seriously. As the Republicans roll out a “healthcare” plan that would leave the elderly and poor at the mercy of the rich—known for their compassion—they’ve clearly displayed their belief that the followers of Jesus who voted them into office will once again rely on the carpenter from Nazareth for their healing. Those of us who’ve spent more than a few devotional hours with the Good Book may be a little less sanguine about the prospects for our aging parents (and let’s be honest, none of us is getting any younger). I guess we can call “Trumpcare” a blatant trumpet blast for the Second Coming. It truly amazes me that Trump supporters don’t see the shady practices of the age-old business deal at work here. Cut my costs, offer you something that you don’t really want, and walk away looking like the guy who was only trying to help. As Kenny Rogers reminded us decades ago, you’ve got to “know when to hold ‘em, and know when to fold ‘em.” Only folding’s not on the table any more. If enough dissatisfied people die off in the next couple of years you won’t even have to worry about midterm elections, I guess. As a member of the human race who’s watched my elders age I don’t see how anyone could ask to have the healthcare taken away from their parents. But then again, this will save the uber-rich in this country quite a bit of money, so there must be a silver lining after all. It’s unfortunate that nobody seems to care that irony is in such short supply. Presidential campaigns waged on hate deliver when it comes to taking away the services of those who voted them into power. Swamp dwellers all. A healthcare bill to make our country sick and weak—who could’ve thought of such a stroke of genius? You’ve just got to trust the rich to have everyone’s best interests at heart. Isn’t it clear that they always do? I often see them hobnobbing with the people who live in cardboard boxes on the streets of Manhattan. I seem to recall a guy with a reputation for healing once saying something about it being easier for a camel to pass through the eye of a needle than for a rich person to get into his hospital. Only he didn’t come up with a healthcare plan before he left. Does anybody have Jesus’ smartphone number? Last month one of the three remaining Shakers died. In this era of religion unawareness, not many Americans, I expect, could identify this dying religion. The Shakers aren’t the Quakers—we like to give religions we don’t understand pejorative monikers—they are a group that grew out of the Friends but that had important differences. Shakers believe, especially, in celibacy. It had to grow through conversion since Shakers could not reproduce biologically. At their height there were about 6000 of them—the number of Twitter followers of a fairly successful humanities professor, I suspect. They were hard-working and their brand of furniture endures beyond the life of the sect. The official count of Shakers worldwide now stands at two. This little bit of news saddened me. Not that I’ve ever been tempted to join the Shakers—it would be a bit of a stretch for a family man—but I’ve always admired countercultural groups. Like many religious sects of the late eighteenth century, the Shakers were millenarians. That is, they believed in the imminent second coming of Christ. Given this belief, biological reproduction wasn’t really necessary. In fact, it was counter-productive. Like so many of the slumberers of the Great Awakening, the Shakers eventually settled in upstate New York. Since their lifestyle was different, they had to form their own communities. The last community is in Maine. When the last two Shakers go to their reward, barring a miracle, the denomination will be extinct. The Shakers were distinctive for yet another reason as well. They were open to, and often defined by, female leadership. This might be expected in a world where men have difficulty controlling themselves in mixed company. Catholic monasteries locked men in without women. To agree to live in a mixed gendered community but without mixed gendered relations took a dose of will power that borders on the saintly. The Shakers won’t be the only religion to have gone extinct, when that happens. Religions, like organisms, grow, thrive, and die. This little group had a disproportionate impact on society. Those who watched Michael Flatley throwing his body across the stage to the haunting joyfulness of the Shaker Hymn “Simple Gifts” likely had no idea that the world owed one of its most beautiful melodies to a group of people living celibate lives in the woods of Maine. The Shakers’ unique contributions to the weird and wonderful world of religion will be missed by at least one. Finishing Charlotte Bronte’s Jane Eyre last night proved timely from the point of view of today’s much anticipated apocalypse. (I hate to leave a book unfinished as the final trump begins to sound.) As I stress to my students at Rutgers (when I actually have a class), the Bible surrounds them whether they are aware of it or not. Quite aside from the present rapture-envy—that one’s just too easy—reading literature of the nineteenth century is an excellent way to show the Bible’s influence on western culture. Jane Eyre is suffused with biblical allusions and direct references, even with the faulty theological notions that the Scriptures had hatched in that century. Of course, the Bronte sisters, all successful novelists, were the children of a clergyman, but other writers of the period demonstrate an equally biblical worldview. In fact, much of the dramatic tension in the present novel revolves around distinctly biblical issues. Interspersed with my reading of classical novels, I read many more recent literary explorations as well. A couple of weeks ago I completed Stephen King’s It, not a particularly favorite novel, but one that at times demonstrated that even masters of the macabre frequently draw on the Bible. For modern literature the Bible is the ultimate foundation. It would be interesting to live long enough to see if it still has any relevancy at the end of the present century. Jane Eyre, perceptive as most nineteenth century novels are, also pressed directly the wound that currently afflicts much of our nation. Cast upon misfortune, Miss Eyre is mistaken for a beggar. Miss Bronte observes, “Prejudices, it is well known, are most difficult to eradicate from the heart whose soil has never been loosened or fertilized by education,” a line that should be emblazoned upon the door of public officials who feel it is their right to withdraw funding from public education. You want an apocalypse? That’s the recipe right there. Nevertheless, Miss Eyre presses on until she reclaims the man who had once “stood between me and every thought of religion,” dodging an impassioned missionary along the way. In revealing the manipulations of the cousin who dies on the mission fields, enriched by Miss Eyre’s beneficence, once again Charlotte Bronte displays her perception of how the church may ultimately rob a soul of its true potential. Upon learning of his death, the now Mrs. Rochester ends this penetrating novel with his words, strangely appropriate for this day of fictional endings: “’My Master,’ he says, ‘has forewarned me. Daily he announces more distinctly—“Surely I come quickly!” and hourly I more eagerly respond, —“Amen; even so come, Lord Jesus!”’” Of course, St. John is here quoting Revelation 22.20. Since I am scheduled to run a 5-K in a couple of hours, if the second coming is about to happen, it would be convenient should it transpire before I end up exhausted in my own personal apocalypse. 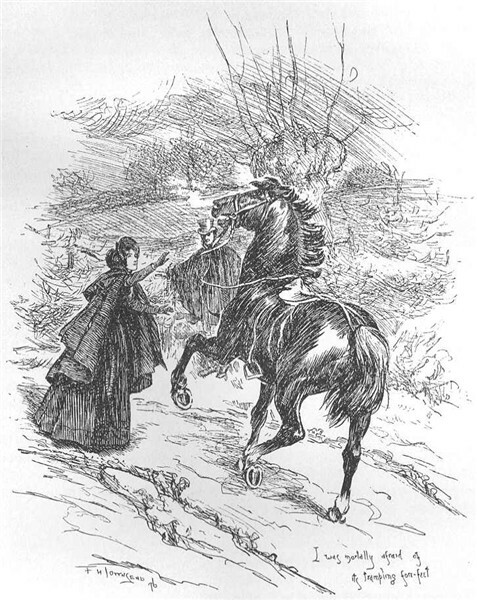 Jane Eyre stopping one of the horsemen of the apocalypse? One of the most heinous theologies to emerge from Christendom is the idea that exploitation of our planet is good for the soul. The idea, apart from having been foundational to Bush II’s administration, is based on the idea that if we mess up our world badly enough we will force the divine hand into sending Jesus back to clear up our detritus. The Second Coming apparently will be in a garbage heap rather than a garden. Christian businessmen rest secure knowing that their exploitation of our natural resources is all part of God’s master-plan. This “theology” is alive and well among many Neo-Cons and it insists that the fact of global warming is a myth and the myth of creationism is a fact. One of the unexpected perpetrators in the war on our planet has been the Bible. Accurate records of the number of Bibles actually printed were not kept in the early days of Gutenberg’s dream machine, but current estimates place the number of Bibles printed at over 8 billion. That’s more than enough for one per person. Some of us would have to confess to owning multiple copies, making us perhaps guiltier than the rest. It was in an effort to stem the dendrite slaughter of this industry that I shifted to the Green Bible for my classes last year. Some people treat the Bible as an object of veneration, never laying it on the floor or putting other objects atop it. Some people object to making Bibles out of “inferior” products – the Green Bible is printed on recycled paper and is biodegradable – but to me this seems to be the most responsible way to produce a book with the enormous environmental impact that the Bible has. I could live without the “green letter” sections intended to prooftext the Bible’s environmental concerns, but care for our planet trumps good taste at times. If anyone from Oxford University Press is reading this, the eco-friendly aspects of this Bible are what reluctantly switched me from 15 years of requiring students to purchase the New Oxford Annotated Bible! It is time that the Bible owned up to its part in our planetary plight. Let us talk plainly about the weather. Global warming is a reality, and yet the issue is clouded by religious conservatism. To be precise, it is difficult to determine whether it is really greed or the religious right that stands so firmly behind free-market capitalism that is driving this chariot of the sun. The strange and unholy alliance between religious and political conservatism, however, has become a force daily striving against reality and its proponents want to be on the top of the pile when the whole thing collapses. I can not speak to the political end of this continuum; I am not a political scientist or economist. As a “religionist,” however, I recognize a deeply disturbing trend that I have followed since my youth. Fundamentalists have consistently taught their young that the “Second Coming” is only minutes, possibly seconds, away. Undaunted by the two-millennium delay in wish-fulfillment, they suppose the words supposedly uttered by Jesus indicate a kind of divine “I’ll be right back” just before pushing off from the Mount of Olives. The signs of the times given in the Bible describe the then current condition, yet modern-day Fundamentalists wish to force the almighty hand, call the bluff of the Texas Hold-‘em expert above. If the general in the sky said wars would come, well, we’ll make wars. If the only way to get his attention is by destroying the planet around us, so be it. Deny global warming for the sake of the religious right, since their world is about to end. The rest of us might want to stick around for a while. 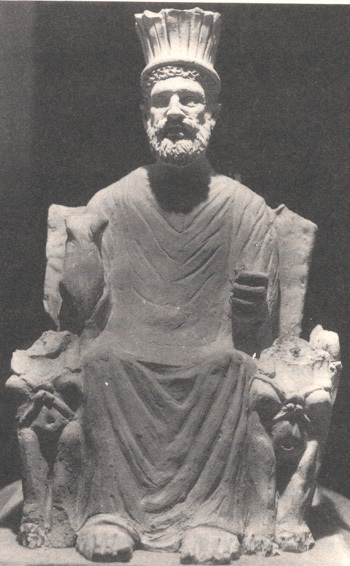 Ancient meteorologists believed that particular gods controlled the weather. At Ugarit Baal, or Hadad, took responsibility for drought and plenty. If there was a problem, they knew just to whom to offer a sacrifice. In our monotheistic western world, we’ve pared the gods down to a single man. Not everyone agrees on his mood or character, but some are convinced that he has his bead trained right on this planet and they want to help from here below. Others believe — o the heresy! — that natural processes control the weather and that we can do something to make our situation better. We might be in a better place if those who believe the gods control the weather were relegated to theology classes rather than political offices. What do God and great pools of gooey, flammable, decomposed ancient biomass have in common? Quite a lot apparently. A picture in this morning’s paper of a Caribbean Petroleum Corp. storage facility explosion took me back to my childhood. I was born in the same place as the oil industry, although I think it was in different hospitals. Northwestern Pennsylvania is where the industrial use of oil was discovered (ancients had learned that the stuff was extremely flammable and used it for cruel weapons, but never figured how to grease an axle with it). One day my brothers and I were playing outside and noticed flames jetting up from an adjacent hillside. We saw giant ashes, some nearly the size of dinner plates, floating down on a summer day and it seemed like a strange gray snow was falling. A funny smell was in the air. That night on the news we learned that a local oil refinery had exploded and when we went to the site to gawk, it was amazing to see colossal storage tanks melted like so many ten-ton candles. It is an image I’ll never forget. My wife’s favorite historian is Barbara Tuchman. We’ve read most of her books. Bible and Sword, however, was especially eye-opening for me. This book describes, step-by-step, how the British Empire forged its alliance with Israel. Tuchman is a meticulous historian, noting minute details that add understanding to the overall picture. One of the key motivating factors that led Lord Arthur James Balfour in his support of a homeland for the Jewish Diaspora was his belief that a physical Israel was required before the Second Coming of Christ could take place. This is a sentiment that has been shared by some recent, very highly ranking American politicians. Enter Col. Edwin Drake. Drake was the first person to have the idea of drilling for oil. Several local prospectors scampered through the hills of Pennsylvania looking for oil streams where petroleum could be skimmed off the water and refined into kerosene. As an alternative to whale oil, petroleum was much easier to collect and didn’t involve peg-legs spearing great white whales — oh wait, wrong story. As an alternative to whale oil, petroleum made a market impact and soon other uses were descried. There was an oil boom near Titusville, Pennsylvania when Drake hit oil, and soon the industry that give birth to Quaker State, Pennzoil, and Enron was up and running. As uses for petroleum multiplied demand shot through the roof. Drake died in poverty and the industry he helped found rolled ever forward. After the Second World War, vast oil beds were discovered in the Middle East. Israel was declared a nation, and world-wide demand for petroleum was astronomical. Not all nations of the former Ottoman Empire welcomed the sudden interest in their natural resources or the presence of an allied nation in their midst. Although the roots go deeper and are much more complex, the scenario was set for a crisis that has lasted for my entire life and shows no signs of slowing down. So what does God have to do with a complex mix of hydrocarbons and other organic compounds? The unbelievable wealth generated by petroleum products has been under-girded with a religious gullibility and deeply held faith that Jesus needs some help in returning. As long as we’re waiting, we might as well get filthy rich. Politicians with connections to Big Oil and the Big Guy have it all figured out. Take all that you can and wait for the God who has blessed you so richly to come home. I still remember that refinery explosion, and some childhood memories have become paradigms and parables that have as many applications as petroleum itself. When the oil beds run dry, what will grease the axles of Kingdom Come?